Probably the closest anyone will get to Top Fuel dragster performance in a street-legal car. The cowboys of our time are no longer those John Wayne impersonators that lasso steer and ride bulls at the local rodeo. You’ll find their modern day equivalents down at the drag strip locking their bodies into bolstered seats with five-point harnesses after signing a piece of paper that ensures they know a roll cage is no guarantee of salvation in case of an accident. Gidi Chamdi is the cowboy in question at North Carolina’s WannaGOFAST event where he set a record for the world’s fastest half-mile run. Shattering the previous record of 248 mph was going to take one hell of a run, but the conditions were perfect and Chamdi managed to reach 250.27 mph on a half-mile strip of tarmac. Let’s all take a moment to collect our jaws from the floor. To put things into perspective, that’s only 11 mph less than a Bugatti Chiron’s top speed done away with in 880 yards. 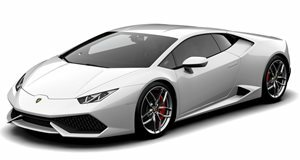 At maximum speed the Huracan is clearing one football field per second. Just as shocking as the record Chamdi set is the fact that his Lamborghini Huracan is street-legal. Tuned by Underground Racing, no stranger to collecting world records with its family of Lamborghinis tuned to make many times the power that their stock counterparts have on tap, this Huracan makes around 2,500-3,000 horsepower at the 5.2-liter V10’s crank with the help of two turbochargers. That's channeled through an all-wheel drive system that enables it to get off the line and clear the quarter mile with a speed of 188 mph. Watching this stock-looking Huracan charge the horizon simply doesn’t get old.